Reading and share top 62 famous quotes and sayings about Failure And Success by famous authors and people. Browse top 62 famous quotes and sayings about Failure And Success by most favorite authors. 1. "Failure leads to improve and success leads to change"
2. "In your temporary failure there is no evidence that you may not yet be a better scholar, and a more successful man in the great struggle of life, than many others, who have entered college more easily." 3. "Failure is not able to have what you planned for, you planning for 'F' and having 'A' is a failure. Success is having what you do expect or planned, having 'F' when you planned for it is a success. Miracle is having a success you dont planned for, it breaks the law." 4. "Bad architecture is in the end as much a failure of psychology as of design. It is an example expressed through materials of the same tendencies which in other domains will lead us to marry the wrong people, choose inappropriate jobs and book unsuccessful holidays: the tendency not to understand who we are and what will satisfy us." 5. "...no one is able to produce a great work of art without experience, nor achieve a worldly position immediately, nor be a great lover at the first attempt; and in the interval between initial failure and subsequent success, in the gap between who we wish one day to be and who we are at present, must come pain, anxiety, envy and humiliation. We suffer because we cannot spontaneously master the ingredients of fulfilment." 6. "The burn is my girlfriend, failure is my ex. I'm married to the track and engaged to success." 7. "Men crawl in slime and wallow in the mud;The Realist groans: "All life is mud ans slime! "Men lie and steal and shed each other's blood;And Realism sees but blood and crime.Yet Right is just as real as Wrong,The mountain peak is real as the ooze,A curse is no more real than a song;Among realities we need but choose.The cynic sees the failure of To-day,The Prophet cries the triumph of To-morrow,Knowing the spirit in our clogging clayThat masters doubt, disaster, loss and sorrow.Failure is but a passing weariness,There is no final answer but Success." 8. "She knows there's no success like failure, and that failure's no success at all." 9. "I think that failure by your own standards is certainly a form of success." 10. "You need to accept your yesterday, so u can be happy on your today, risk and failures will always be there, and so is success." 11. "Most of these students are so conditioned to success that they become afraid to take risks. They have been taught from a young age by zealous parents, schools, and institutional authorities what constitutes failure and success. They are socialized to obey. They obsess over grades and seek to please professors, even if what professors teach is fatuous. The point is to get ahead, and getting ahead means deference to authority. Challenging authority is never a career advancer." 12. "It is Basic Management 101 that if you reward failure you are going to get more failure, and if you want success you should reward success. But if you look at the way this administration has approached national security, they have kind of got that principle backwards." 13. "When the mind becomes so completely absorbed in perfect health that all sickness is forgotten, all the powers of mind will proceed to create health, and every trace of sickness will soon disappear. When the mind becomes so completely absorbed in higher attainments and in greater achievements that all thought of failure is forgotten, all the forces of mind will begin to work for the promotion of those attainments and achievements. The person will be gaining ground every day, and greater success will positively follow." 14. "Develop success from failures. Discouragement and failure are two of the surest stepping stones to success." 15. "The will to persevere is often the difference between failure and success." 16. "We are all misfits, poseurs, and clowns. We are heartbroken and lonely, failures in life, criminals and frauds. Most of our successes are pleasant illusions. Through the books on the shelves, the library becomes a support group and lets us know that we are not alone. Once we realize we are not alone, we can relax, set our burdens down, and move on." 17. "Before this government came to power, many failing schools were simply allowed to drift on in a pattern of continuing failure. The government is determined to break that pattern and is successfully doing so." 18. "The failure and the success both believe in their hearts that they have accurately balanced points of view, the success because he's succeeded, and the failure because he's failed. The successful man tells his son to profit by his father's good fortune, and the failure tells his son to profit by his father's mistakes." 19. 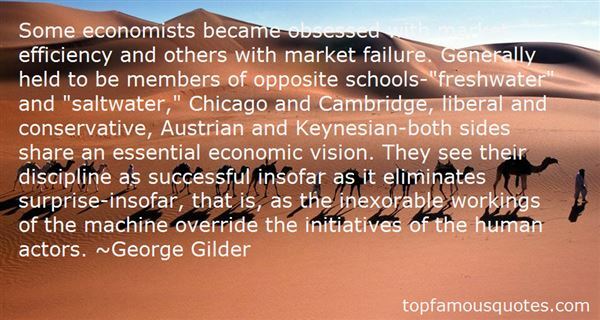 "Some economists became obsessed with market efficiency and others with market failure. Generally held to be members of opposite schools-"freshwater" and "saltwater," Chicago and Cambridge, liberal and conservative, Austrian and Keynesian-both sides share an essential economic vision. They see their discipline as successful insofar as it eliminates surprise-insofar, that is, as the inexorable workings of the machine override the initiatives of the human actors." 20. 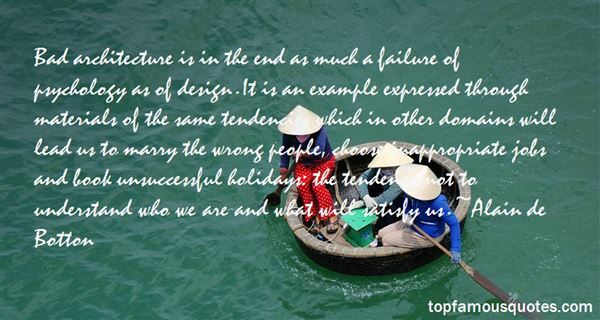 "It is on our failures that we base a new and different and better success." 21. "Barometer of success in later life is not that they always win, but how they deal with failure. An ability to pick themselves up when they fall, retaining their optimism and sense of self, is a far greater predictor of future success than class position in Year 3." 22. "I took the route favoured by all worldly failures and became a spiritual success." 23. "I hate to be a failure. I hate and regret the failure of my marriages. I would gladly give all my millions for just one lasting marital success." 24. "I'm simply a businessman who has seen his share of failures and successes." 25. "(The psuedoscience of planning seems almost neurotic in its determination to imitate empiric failure and ignore empiric success.)" 26. "Dreams are the result of a million choices, a billion failures, and a few successes." 27. "Success could be defined as the ability to go on persevering even when it seems that there are no possibilities left. Each failure is not truly a failure, just another possibility explored and found wanting. We never truly run out of possibilities for success, just imagination to find them." 28. "We do not know, in most cases, how far social failure and success are due to heredity, and how far to environment. But environment is the easier of the two to improve." 29. "It has always seemed strange to me... the things we admire in men, kindness and generosity, openness, honesty, understanding and feeling, are the concomitants of failure in our system. And those traits we detest, sharpness, greed, acquisitiveness, meanness, egotism and self-interest, are the traits of success. And while men admire the quality of the first they love the produce of the second." 30. "The things we admire in men, kindness and generosity, openness, honesty, understanding and feeling are the concomiants of failure in our system. And those traits we detest, sharpness, greed, acquisitiveness, meanness, egotism and self-interest are the traits of success. And while men admire the quality of the first they love the produce of the second. (Cannery Row)"
31. "How easily we accept the fact that this is a varied world, with many races, cultures, and mores. In America we rejoice in this diversity, this pluralism, which makes up the rich pattern of our national being. We should learn to accept this pluralism in ourselves, to rejoice in the truth that we human being consist of a variety of moods, impulses, traits, and emotions … If we become pluralistic in thinking about ourselves, we shall learn to take the depressed mood or the cruel mood or the uncooperative mood for what is, one of many, fleeting, not permanent. As pluralists we take ourselves for worse as well as for better, cease demanding a brittle perfection which can lead only to inner despair. There are facets of failure in every person's makeup and there are elements of success. Both must be accepted while we try to emphasize the latter through self-knowledge." 32. "Starting a business isn't for everyone, and it's not what you should do if you aren't sure what else to do. It requires thick skin and the willingness to carry a great deal of stress, sometimes alone. It's more often a life of failure than a life of success, and the majority of successes came after a long road of disappointment, and often shame." 33. "Keep in mind too, our failures serve to teach us, and usually teach us more than our successes do. What we may perceive as a failure is also an opportunity for someone else to rise to the occasion and perform a mitzvah, or mitzvot. Do not begrudge someone their joyous performance of mitzvot. Sometimes, perhaps even more often then you may think, what we consider our failures were blessings in disguise for ourselves, or others, or everyone. Abraham did not change the world just because he himself changed, and followed his own destiny. He changed the world through his giving others opportunities to rise to their own greatness." 34. "God, help me to tell the thruth to the strong and to avoid telling lies to get the weak's applause. If you give me success, do not take away my humility. If you give me humility, do not take away my dignity. God, help me to see the other side of the medal. Don't let me blame others of treason just because they don't think they like me. God, teach me to love people as I love myself and to judge me as I judge others. Please, don't let me be proud if I succed, or fall in despair if I fall. Remind me that failure is the experience that precedes triumph. Teach me that forgiving is the most important in the strong and that revenge is the most primitive sigh in the weak. If you take away my success, let me keep my strength to succeed from failure. If I fall people, give me courage to apologize and if people fail me, give me courage to forgive them. God, if I forget you, please do not forget me." 35. "America is now a land that rewards failure--at the personal, corporate and state level. If you reward it, you get more of it. If you reward it lavishly as the federal government does, you'll get the Radio City Spectacular of Failure, on ice and with full supporting orchestra. The problem is that, in abolishing failure, you also abolish the possibility of success, and guarantee only the huge sucking statist swamp. From Motown to no town, from the Golden State to Golden Statists. What happens when the policies that brought ruin to Detroit and decay to California are applied to the nation at large?" 36. "And didn't it always go like that--body parts not lining up the way you wanted them to, all of it a little bit off, as if the world itself were an animated sequence of longing and envy and self-hatred and grandiosity and failure and success, a strange and endless cartoon loop that you couldn't stop watching, because, despite all you knew by now, it was still so interesting." 37. "Like most Eastern Europeans, he was not amenable to the socialist ethic so many Israeli leftists still romanticized, despite the proven failure of Communism to solve any of the world's problems and its unenviable success in inventing many new ones." 38. "Failure is a trickster with a keen sense of irony and cunning. It takes great delight in tripping one when success is almost within reach." 39. "When You Love Your Success, Why Don't you Love Your Failure Which Lets You Know About Your Drawbacks And Help You In Achieving A Much Needed Success ! !" 40. "Failure is the ultimate motivator, the supreme teacher, and the definitive guarantee of life. Failure is what makes success so addictive." 41. "When you take God into partnership, when you are conscious that you are doing His work, you have a feeling of peace and security. You walk as one who sees a great light because you feel that you have a great Partner, One with whom you cannot lose your way. You do not fear failure because you know that your divine Partner is the very Source of all supply, and you feel safe, reassured. You know that nothing can prevent your success as long as you and your Partner are in harmony." 42. "(Ulrich, 100 year old Bulgarian man): in Solo, by Rana Dasgupta"Ulrich has sometimes wondered whether his life has been a failure. Once he would have looked at all this and said yes. But now he does not know what it means for a life to succeed or fail. How can a dog fail its life, or a tree? A life is just a quantity; and he can no more see failure in it than he can see failure in a pile of earth, or a bucket of water. Failure and success are foreign terms to such blind matter." (p. 160)"
43. "We may well discover that the business failure we avoid and the business success we strive for do not lead us to personal success at all. Most of us have inherited notions of "success" from someone else or have arrived at these notions by facing a seemingly endless line of hurdles extending from grade school through college and into our careers. We constantly judge ourselves against criteria that others have set and rank ourselves against others in their game." 44. "A perfect couple shares their failures, mistakes and their successes equally and deal with them all as a team." 45. "You are thinking of failure as the enemy of success. But it isn't at all. You can be discouraged by failure-or you can learn from it. So go ahead and make mistakes. Make all you can. Because, remember, that's where you will find success." 46. "Forget being a bad failure, use Cosmic Ordering and be good at success." 47. "He learned that almost all of the world lived in colossal and constant fear.Afraid of everything-the police,officials and courts,the thugs,criminals and mafia;afraid of the establishment and the anti-establishment;afraid of failure and of criticism,of being humiliated and being mocked,of being ugly and bald;afraid of cockroaches and of cats,of the seas and the skies,of lightning and of electricity;afraid of priests and physicians;afraid of dying and of living.More than hope,people's life seemed to be defined by fear.Most hope,it seemed,was only about somehow negotiating the fear successfully.A tiny minority managed to cross the line of fear and this tiny minority then became the shapers of the world in which the rest lived." 48. "So you think that you're a failure, do you? Well, you probably are. What's wrong with that? In the first place, if you've any sense at all you must have learned by now that we pay just as dearly for our triumphs as we do for our defeats. Go ahead and fail. But fail with wit, fail with grace, fail with style. A mediocre failure is as insufferable as a mediocre success. Embrace failure! Seek it out. Learn to love it. That may be the only way any of us will ever be free." 49. "Advice? Fail constantly. Because the word doesn't mean what you think it means, especially when you're an artist. I use the word artist to mean everything from songwriting to writing a novel to even writing video games. Anything that tells a story, which is almost any medium. Gotta take risks, you gotta go through multiple drafts which means you have to FAIL, a lot. So you won't always get the reaction you always want from every single person, so when you lose that fear of failure, when you stop even thinking of it as failure, and you push yourself farther, you'll take bigger risks, and eventually, after about six or seven hundred rejections, you'll find success. And you'll find a way of conveying what you really want to say, in the best manner." 50. "Trade and wealth creation is not all upside. It is failure, too.Failure is a necessary component to growth and success. Babe Ruthstruck out 1,330 times but also hit 714 home runs. We need to letfailing entities fail. Only then will successful people turn these enterprisesback into wealth-creating vehicles again. "Too big to fail" is aconcept that perpetuates failure and saps vitality from the rest of thewealth creators to do so." Life begets intelligence, intelligence begets smart matter and a singularity."